Access arch where fire was kindled. This lead to the eye at base of the chamber. 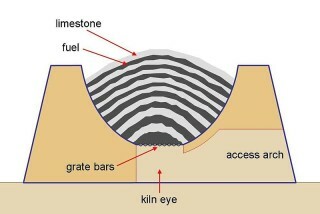 Diagram of lime kiln structure and the layering of limestone and fuel in the chamber. 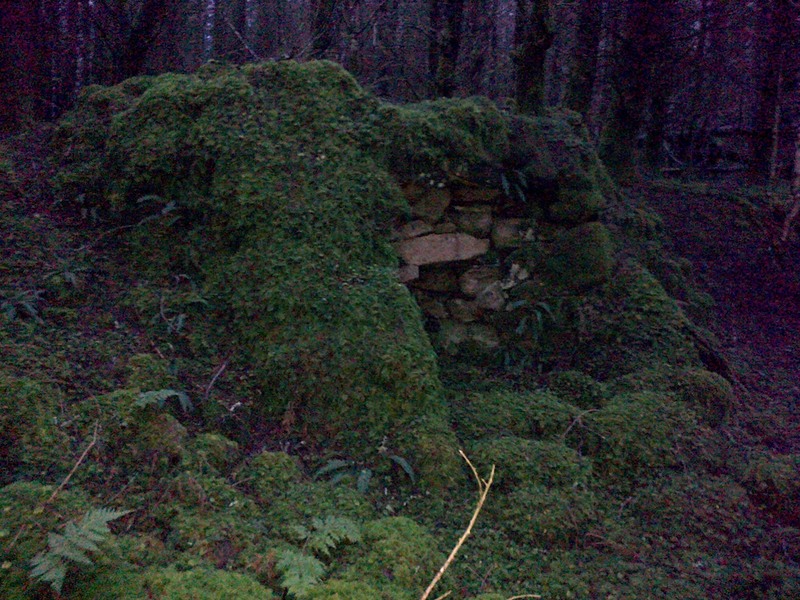 Lime kilns were once common features of rural landscapes throughout Ireland in the 18th, 19th and 20th centuries. Now, unfortunately, most have been destroyed or have faded into the landscape. 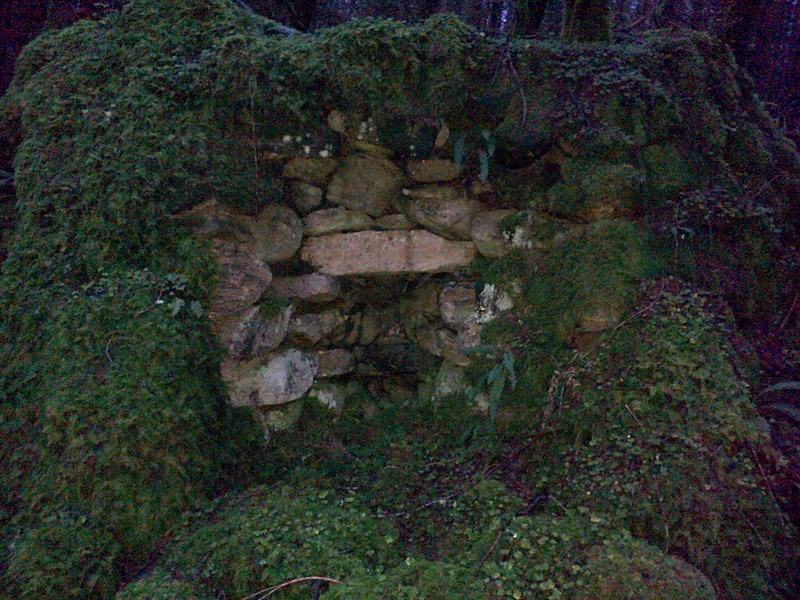 Lime kilns were structures in which limestone was heated to a high temperature to produce quicklime. 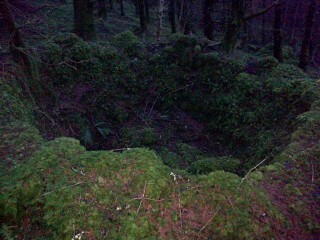 As the pictures show a particularly well preserved example of a lime kiln can be seen on a sloping hillside in a planted forest to the west of Lough Buffy. The most common type of lime kiln consisted of an egg-cup shaped burning chamber constructed of brick or stone with an air inlet at the base called the ‘eye’. The limestones to be burnt had to be broken into fairly uniform pieces about the size of a man’s fist (by hand or using a hammer) before they were transported to the site by horse and cart or wheel-barrow. The burning process began with the laying of an iron grate over the eye at the base of the chamber. Then alternating dome-shaped layers of limestone and fuel (wood, furze, coal, turf) were built in the kiln chamber on top of the grate bars. When loading was complete, the kiln was kindled at the bottom and the fire gradually spread upwards through the eye into the chamber burning limestone and fuel in succession. When burnt through, the quicklime was cooled and raked out through the base while the fine ash dropped out and was rejected with the riddling (larger waste materials). Because the lime kiln was filled from the top, and could also be unloaded from the top, access to the top was necessary. Therefore, kilns were generally constructed on either a rock face or earthen bank to permit this. Ramps were sometimes built to allow access also. This page was added on 30/08/2013.